I love my reusable shopping bags, but I admit it took me a while to find ones that I liked. I figured that since they were something I would be using often and for a long time, I should like both the way they worked AND they way they looked. I hated the bags for sale at our local Cub grocery store. The shape and function of them were good, but they were an ugly cardboard brown color with a big red Cub Foods logo - ugh. I waited and waited until I actually found the same bag but with a nicer design at a different grocery store while on vacation! It's a great bag because it's sturdy with a flat bottom - so it stands up on its own. 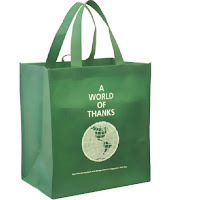 I've been searching for the same bag online and found World of Thanks Reusable Tote Bags. I wish I had found them earlier, because I paid more for mine at the grocery store! The other bag that I LOVE is one that I won from a sweepstakes. 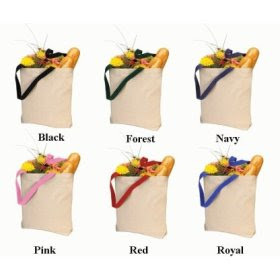 It is made of canvas and has long straps so you can carry the bag on your shoulder. This is the bag I always fold up and keep in my purse for unexpected shopping trips. After doing a search, I found these Groovy Earth Canvas Grocery Tote Bags. They have 22" handles so would be great for over the shoulder. • The bag should be washable. It will be holding food so you want it clean! • The bag should be lightweight - it will be heavy enough with the food in it! Oh definitely washable--I can't count the times things have spilled. Good tips, thanks!